Pairs skaters at the Italian overall 2009 Figure Skating Championships. 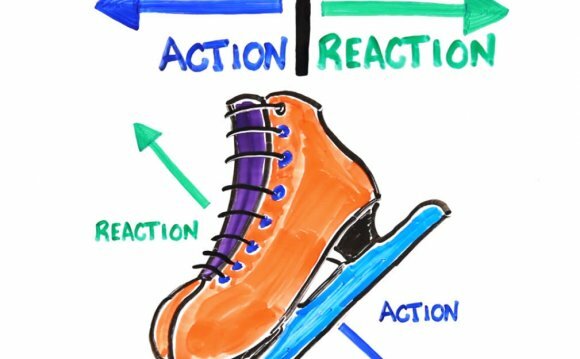 And as the men hit the ice to show off their spins and combinations Tuesday in the Winter Olympics, here's a perfect chance to watch examples of basic scientific concepts, such as friction, momentum, and the law of equal and opposite reactions. So what is friction exactly? It's a force that resists when two objects slide against each other, dissipating their energy of motion. Friction arises because the molecules on both surfaces bond with each other, and resist when the surfaces try to move away and break the bonds. The more rough and jagged something is, the more easily more of its molecules will come into contact with molecules on the surface it touches, and thus the greater force of friction they will exert. The general low level of friction on ice allows a skater to glide along the surface smoothly without friction stopping the motion as soon as it's begun. Remember Isaac Newton's first law of motion — an object in motion tends to stay in motion unless acted on by a force? This concept is also known as inertia, and it's why ice skaters, whose motion isn't being acted on by a powerful enough force of friction, tend to stay in motion unless they use force to stop themselves. At the same time, if there were no friction at all on ice, skating would be impossible, because it is the friction between the skate and the ice when a skater pushes off that starts the motion to begin with. And friction is also what allows a skater to ever come to a stop. Momentum, which is basically how much force it would take to stop a moving object. Essentially, the heavier something is and the faster it's going, the more momentum it will have, and the harder it will be to slow it down. Angular momentum applies to a body rotating around a fixed object. The amount of angular momentum, say, a spinning skater has depends on both the speed of rotation, and the weight and distribution of mass around the center. So, for two skaters of the same mass rotating at the same speed, the one with its mass more extended in space will have the greater angular momentum. A fundamental law of physics holds that momentum is always conserved, meaning that unless some outside force enters a system, its total momentum must stay constant. What Is the Physics of Figure Skating?